Scavenger Hunt Part 2: Where did Joan live in the 1930s and 1940s? On my trip to Chicago to give a talk about Joan and her diary Home Front Girl at the Schaumburg Township District Library in Illinois, part of the greater Chicago area, I stayed with a dear college friend, Phil. We undertook an exciting and unexpected treasure hunt to find out where my mom, Joan, lived in the 1930s and 1940s. You can read about the first part of this scavenger hunt here. I know that in 1932, Mom lived at 214 S. Throop Street. We didn’t get to visit there. But soon we did go to her home for many years in the 1930s in the Lakeview neighborhood, north of the Loop at 821 West Cornelia Avenue. 821 West Cornelia Avenue. My mom lived here for a number of years in the 1930s! Her doorway, a bit updated. I don’t think there were satellite dishes back then. and then Horace Greeley. She writes about her school newspaper work while at Horace Greeley when she is 14. 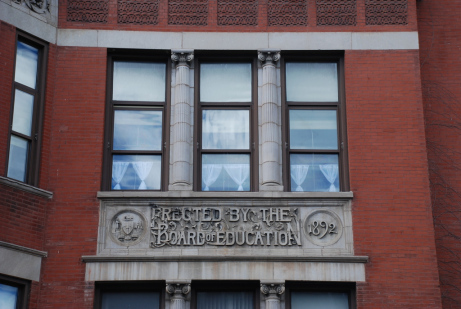 ….At [the school paper’s] reporters’ meeting, I was commissioned to write up Horace Greeley School’s exhibit at the library oh – phooey – I think I’ll spring a poem on them. Just for punishment, you know…..Got my hair set today. In my opinion, if I had hollower cheeks, I’d be a perfect double for Garbo…..
Greta Garbo does share Joan’s Swedish heritage, but they didn’t look alike! Joan jokes as usual…..
Joan then attends Lake View High starting in the fall of 1937. She loves to write, and in her diary talks about her writing prospects–she is a bit dubious. Lake View had an Open House Friday night and Mrs. Turner, my ex-English teacher, told Mother I’d be a great writer someday —- Hm…hm…. 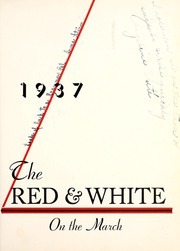 Here is the yearbook from the year she attended. This is before she transferred to “U-High” (University Laboratory Schools) for junior and senior years of high school. You can read more about that wonderful experience here. 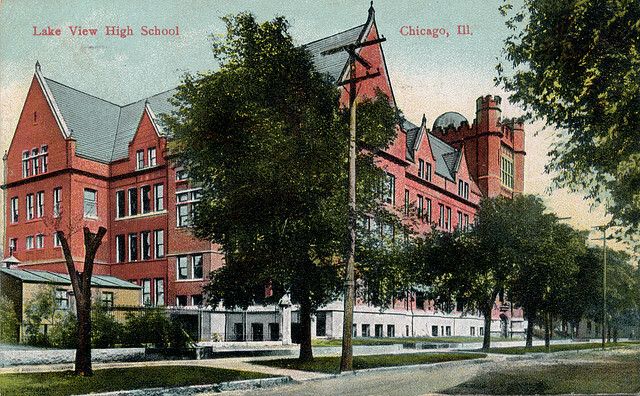 U-High sits right next to the University of Chicago–many miles away. So Joan was chronically late to class for two years. This diary entry she wrote at age 15, almost 16. Well, I’ve started at University High! I got there late as usual but I’ve resolved—never again. It was all on account of the “L”, you see. The Jackson Park Express doesn’t stop at Belmont in the morning—only I didn’t know that. Waited patiently, the ”L” came…I brightened up…L passed by…I stormed up to guard who was already explaining to an irate young man. He told us what “L” to take to Chicago Ave. We got on very crowded train. Finally reached Chicago Ave. Me and irate young man (no longer irate) got off. We were way at the end of funny platform. We began to walk, slowly, puzzledly. Did you ever walk in perfect harmony, without talking. We did. Finally “L” came. Got on. He got off the stop before me. I was 15 minutes late….. Almost every subsequent entry about school indicates she was late. 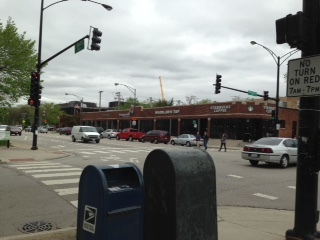 Finally, her parents moved south to Hyde Park, the neighborhood where U-High and the University of Chicago are. That way she could easily walk to school–though she was still always late!! She lived at 4950 Blackstone Ave. in 1940 and 1941. Though my friend Phil drove me there, the apartment she lived in had long been replaced by something from the post-war period. I know my mom lived here, because she had written her name and address on the title page. Joan has written her name and address on the top of this page. 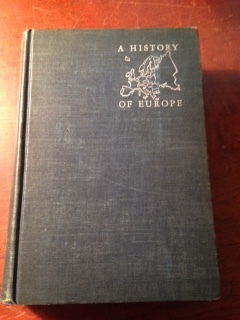 Joan wrote the following dates and events in various inks on page 763 of her history textbook, which was Ferdinand Schevill’s A History of Europe from the Reformation to the Present Day (NY: Harcourt, Brace and Company, 1940). 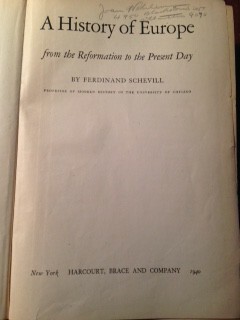 Ferdinand Schevill’s A History of Europe from the Reformation to the Present Day (NY: Harcourt, Brace and Company, 1940). Joan’s pen marks indicate events happening in Europe. Phil and I did manage to visit 5629 Dorchester Ave. where I know she lived in January 1942. 5629 Dorchester Ave. Joan lived here in January 1942. I love the architectural details. And of course I couldn’t visit Chicago without the obligatory pilgrimage to the corner of 55th and Woodlawn in Hyde Park. My grandparents lived here for many years in my memory. 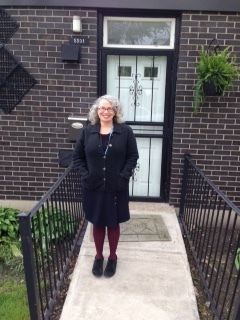 Me (Susie) in front of 5501 South Woodlawn Ave. where my grandparents lived. And kitty-korner is a watering hole of great importance to family lore. The Woodlawn Tap, aka “Jimmy’s”, is looking a bit more hipstery than it did in the 1960s, 70s and 80s when I was taken there, even as a child! I’m so grateful to my dear friend Phil for exploring on this adventure with me and to my mom for leaving all these clues so we could undertake this treasure hunt to find her homes from when she was young!